Brides have fallen in love with blush pink and are using it as a prominent color throughout their wedding, from the flowers to the stationery and decor, their wedding dress, and of course, the wedding cake! The feeling is romantic and soft, and everything is so pretty! 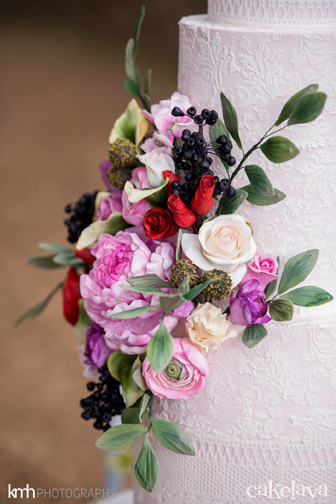 For our wedding cakes, this translates to whisper soft colors, pretty textures, and gorgeous flowers with delicate petals and full blooms. These are a few of our recent favorites! 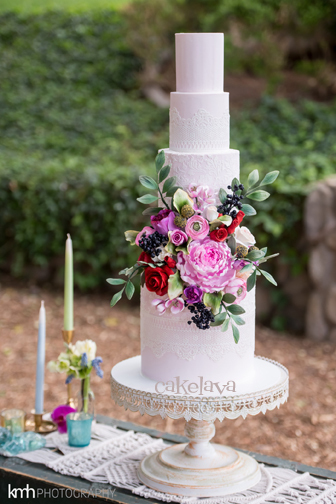 cakelava was invited by Las Vegas wedding and event planner Emily Reno of Weddings & Events by Emily to design a wedding cake for her blush pink garden themed wedding shoot at the Hilton Lake Las Vegas. Emily provided Rick with a color palette and some inspiration photos and he designed a wedding cake that integrated blush pink, soft textures, watercolor painting, and beautiful delicate handcrafted flowers. 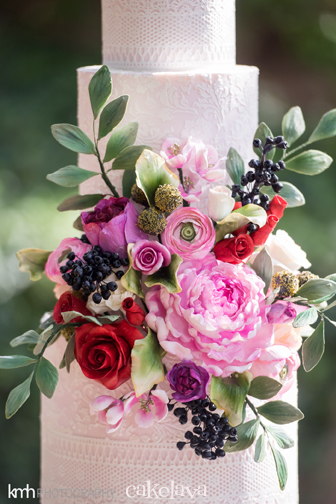 The wedding cake is shown in the photo above and below and was beautifully photographed by Kristen Joy Photography. The cake was paired with pink and gold floral china plates and placed on top of a gold bar cart. We were proud and honored to work with such a talented group of wedding vendors! The entire list of fabulous vendors can be seen on the post "Whimsical Pink Garden Wedding" which was featured on the wedding and lifestyle blog, Inspired By This. 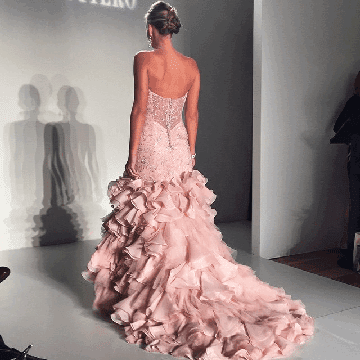 Another way brides are using blush pink is in their wedding dress. Some of our blush-ing brides are choosing to walk down the aisle wearing a pretty pink dress rather than the traditional white or ivory. The model bride in our wedding shoot above wore an exquisite gown of white lace and blush pink tulle. Our bride Arielle also wore a blush pink wedding dress (shown below). When we began working with her, she mentioned she would be wearing pink and would like a similar soft blush pink color for her wedding cake. 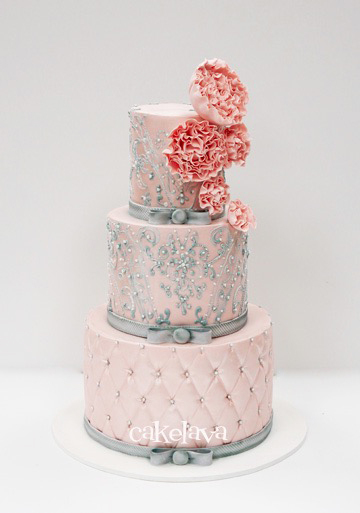 After seeing her beautiful dress, Rick was inspired to incorporate some of the same design elements found in her dress onto the cake - blush pink color with silver "beaded" accents, and made flowers loosely reminiscent of her ruffled skirt. The cake seemed like a perfect compliment to her dress! 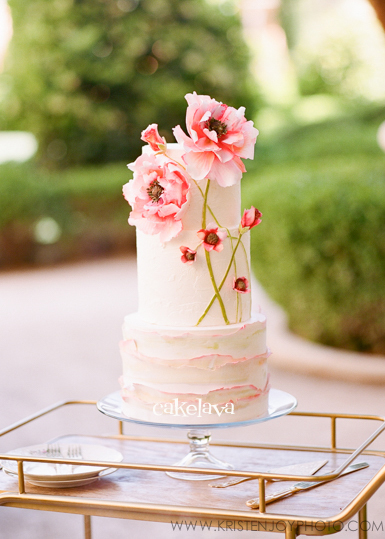 This next blush pink cake was designed by Rick back in the spring and remains one of our most loved cakes this year. It was created for a Boho chic themed wedding photo shoot at Legends Ranch. The styled shoot was designed by Paulina Clute Events and exquisitely photographed by KMH Photography. We loved Paulina's vision for her Boho chic wedding and her color palette of blush pink, ivory and sky, with pops of magenta, teal and forest green. Rick designed a 4-tier tall and narrow blush pink colored cake covered in white lace with a spectacular bunch of his handcrafted flowers placed in the middle of the tier. It was very romantic and managed to bring together a feeling that was both soft and bold, and refined and wild, all at the same time. I loved all the contrasts! 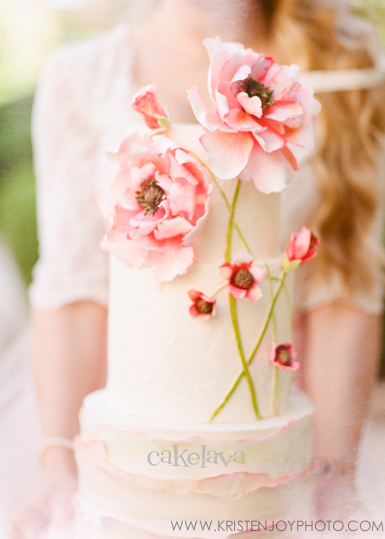 Our cake and the Boho Chic wedding shoot was featured on the wedding blog, Bridal Musings earlier this summer. As the Las Vegas wedding season quickly approaches, we have more cakes with blush pink in the works and looking forward to making every one of them!